Yesterday I finished work, not just for the day, but for about 10 months. My maternity officially starts at the beginning of August, from now until then I'm using up all my annual leave. 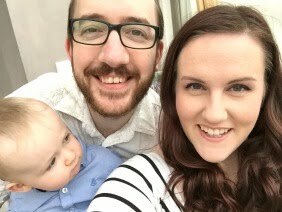 Squidge, hubby and I have a massive change in routine that's going to take a while to get used to. 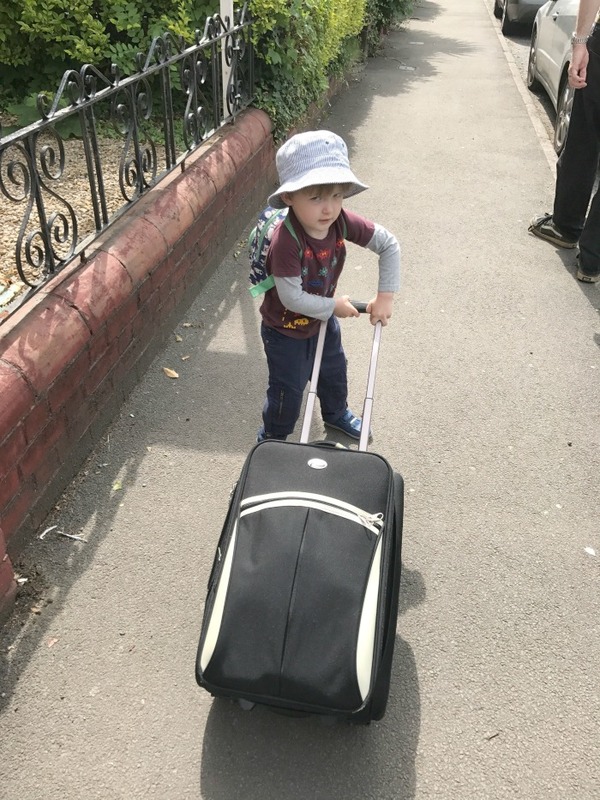 Our old routine was good, Monday - Thursday Squidge would go to his grandparents and I'd go to work (hubby would work all 5 days). Weekends were ours, Sunday mornings were swimming lessons. Not all of this is changing. Friday's would be mine and Squidge's day together. I had to start planning for the changes the baby will bring. I'm worried about how I'll cope with feeding a newborn baby and dealing with a somewhat demanding toddler (aren't they all demanding?). 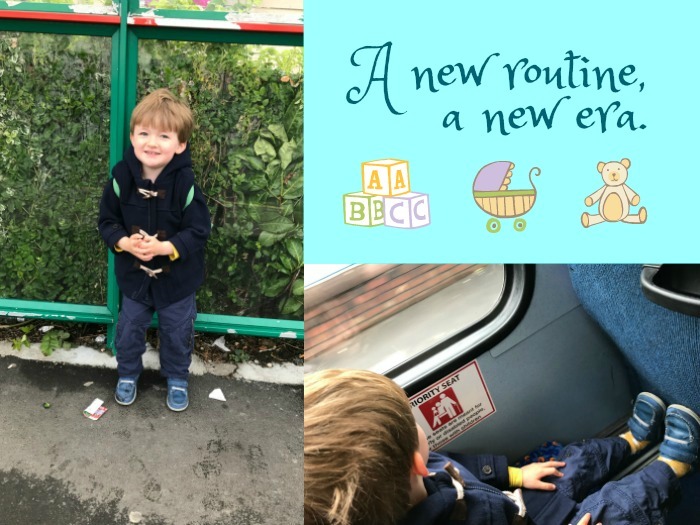 So to prepare for that, I thought it might be good for Squidge to start going to nursery just for 1 day a week, for 2 reasons. Firstly, every time we take him to somewhere with other kids he gravitates towards them and wants to play, plus his language skills are still behind - his vocab is amazing, but his pronunciation needs work, hopefully being around other children will help this. And secondly, I've reached a point in the pregnancy where I'm knackered and could definitely do with a good 1-2 naps per day, afternoons in work were tough! So I signed him up because I think it'll be good for him, and it'll be good for me to have a day to rest and prepare for the baby. Thing is the only day of the week they could fit him in was a Friday, which has always been our day together. So here I am, it's Friday morning, I'm in the house by myself and he's at nursery. I'm sure he's having a blast, but my god does this house feel empty and quiet (I do have a radio on for company). I miss him like crazy. So that's the first part of our new routine, no more mummy/Squidge Friday's. He's also going to still go to his grandparents - if we stopped that, he'd miss them like crazy, and they'd miss him. 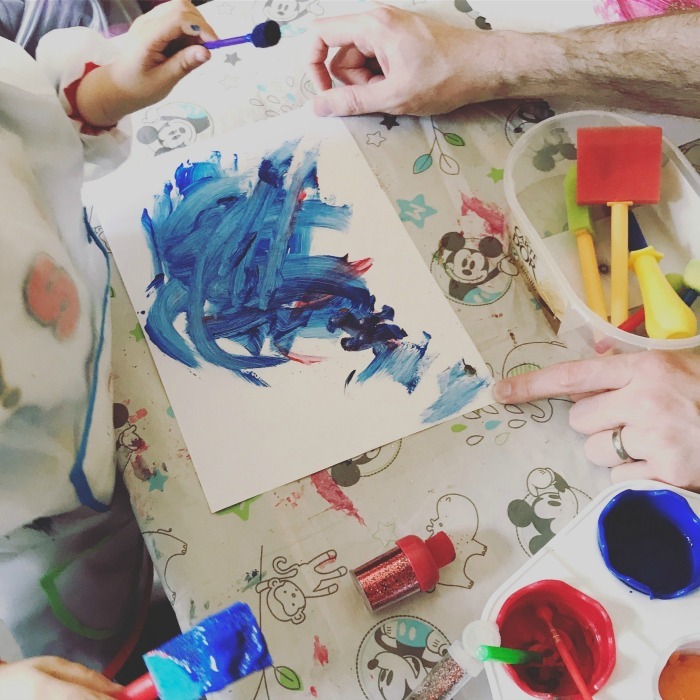 It's nice to keep some of the old routine going for familiarity while we're going through some pretty major changes as we prepare for a new baby. He'll be going there for 2 days a week. So from now and until January (when he starts his free hours in school) it'll be me and the baby for 3 days a week, and the 3 of us for 2 days a week - all of us at weekends :) Hopefully I'll adjust to being apart from him, but today was always going to be tough, I just need to remember that. Excuse the tummy bumps in the pic above - they're the draw strings on my PJ bottoms :) How is this pregnancy going so fast!? 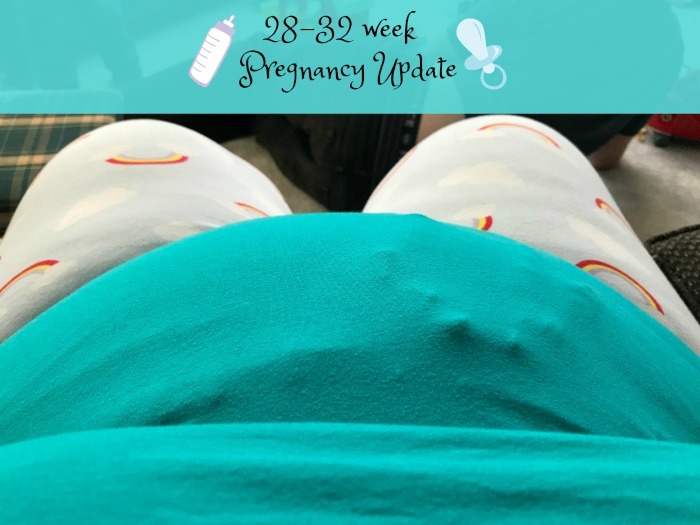 I can't believe I'm sat here, in my jammies writing this and I'm 32 weeks pregnant. It only feels like a couple weeks ago I excitedly waited for hubby to come upstairs to bed so I could show him the positive pregnancy test! But that was late Nov/early Dec last year! How time flies. 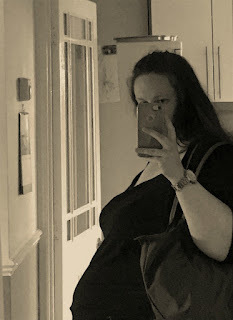 I'm ever growing and my belly is becoming rounder and more uncomfortable by the day. Jeans have become very uncomfortable to wear, but they're still my go-to for work. Oh yeah, speaking of work, I only have 2 weeks left (2 weeks today actually) until I finish for maternity leave! By that time I'll be 34 weeks, meaning I'll officially be 'full term' (37 weeks) from the 19th July (due date is 9th Aug). 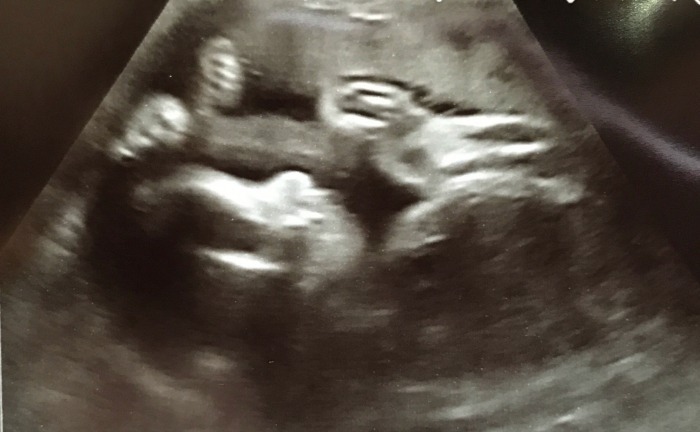 I had a scan just over a week ago, and Dot is still breech. They're still not too concerned as there's plenty of time for him to move/turn. He's growing nicely and all seems well, so they're happy at the moment. I have another scan when I'm 35 weeks, so hopefully he'll have turned by then, fingers crossed! They also weighed me, in total I've gained 8lbs, so they're really happy with that - should all be the weight of the baby (3.5lbs), amniotic fluid, placenta and all the extra blood I'm carrying (2litres). Symptoms-wise, it's been heartburn city, especially if I haven't drunk enough in the day. I'm not sleeping that well, and I'm feeling pretty uncomfortable, but that's to be expected. My feet haven't been as swollen this time, which I think is partly down to wearing jeans/socks/shoes instead of dresses and ballet pumps (they always swell with those!). My allergies still aren't great too, but they haven't been keeping me up at night as much as before (apart from last night!). I also want to buy a cord tie for when he's born to use instead of the usual plastic clamp. Technically, they're crocheted and with cotton, so I could easily make one myself, but I really need the care instructions, so I'm going to buy one/have one made. 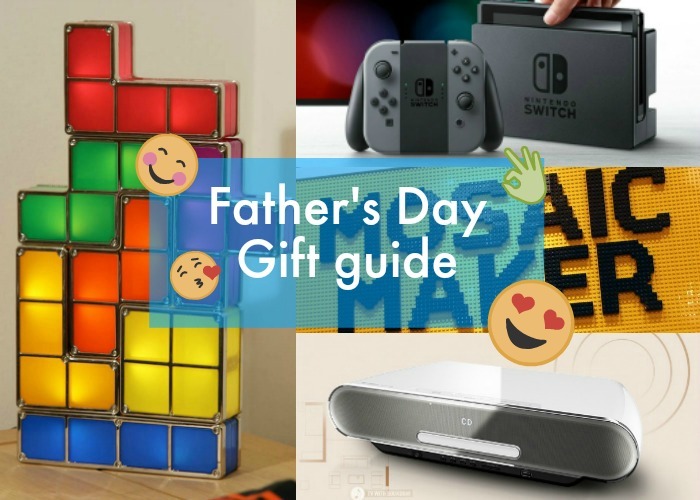 I've been thinking a lot on what Squidge, Dot and I can get hubby as a fathers day present this year, and I'm still pretty perplexed over what to get. Last year he got lots of nice tool-type stuff, like a Stanley tool belt (super useful! ), a small tool box for around the house, things like that. This year I want to get him something different. 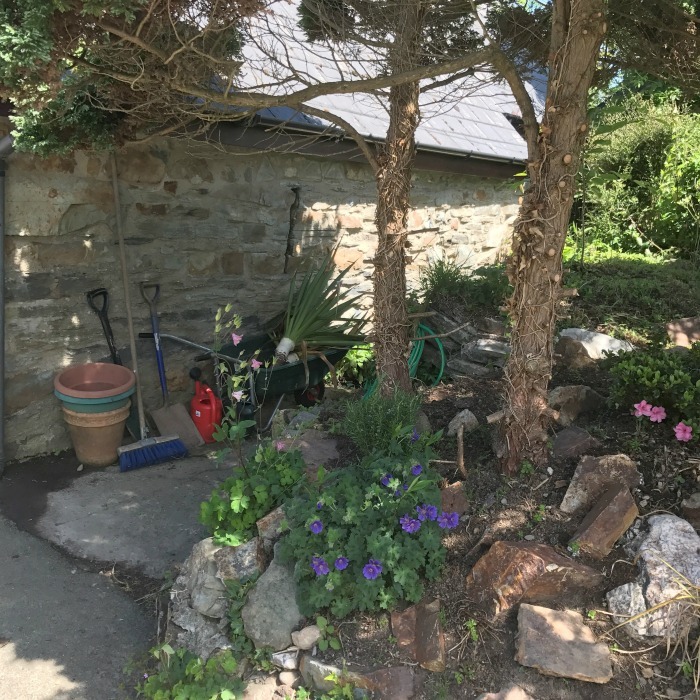 We moved house a year ago and there's still tonnes we need to do, so here's a look at some of the things I've been considering. As much as it's out of our price range, a girl can dream eh! We've been eyeing up sound bars and wifi speakers for some time, but I'm yet to decide on what one will get us the best value for our money. What I love about this one, apart from the sleek modern look, is the fact that we could utilise our music subscriptions (I'm on Apple Music, hubby is on Amazon) to stream music to the speaker, exactly what we want. Better yet, the sound quality will be excellent, unlike our current solution (a small iPod speaker we subsequently don't use). 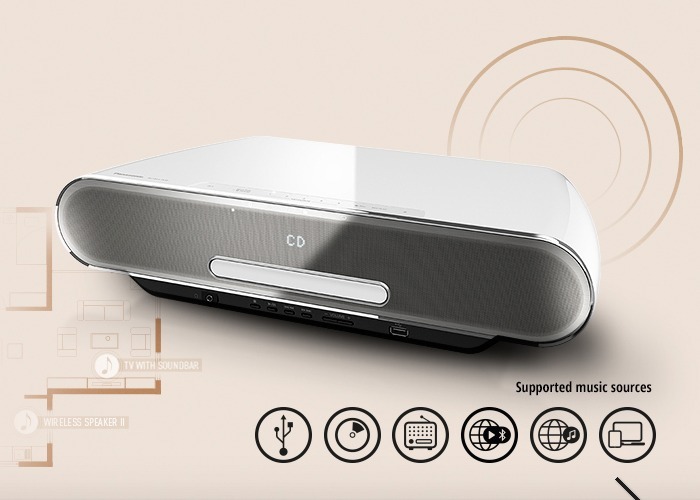 The Panasonic CD speakers look beautiful, and I love that you can still put actual CDs in them, as we still like to buy CDs for our collection. If you're interested in this piece of kit, it'll set you back £379.99. 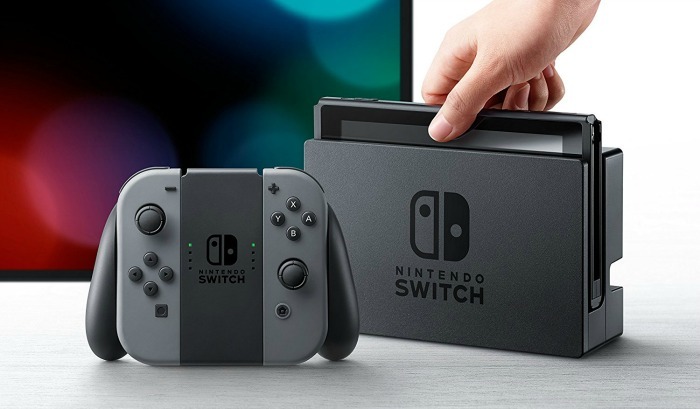 And while it's hard to get hold of, I couldn't put this slightly geeky guide together without giving mention to the Nintendo Switch. We bought one back in April, waited for it to be back in stock, and it was delivered mid-end May. It's such a great little console! Handheld with a high quality touch screen, and the pop it in the holder, plug the holder into the TV and you have yourself a full on console that multiple people can play on the TV. The games out for it are great (Mario Kart 8 deluxe, Zelda, Street Fighter 2, and SO many more). It's expensive, but in my opinion, worth it *if* you can get hold of it. It'll set you back around £279 (depend on deals etc). If Daddy is a bit of a Lego geek (I'm literally surrounded by Lego fans!) 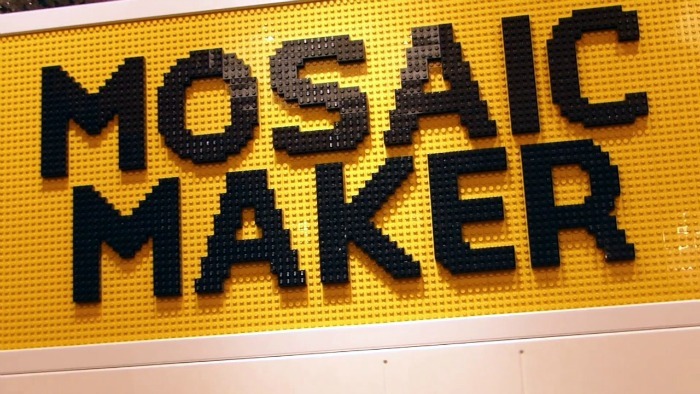 then why not visit the Leicester Square store in London and head to the mosaic maker. For £99 you can have a lego portrait of you made. The portrait could be of Daddy, or the kiddies, or all of you :) Whatever you like really :) Plus it doubles up as a task, as it'll give you the instructions and bricks to make it all. Here we're talking geeky things. I've had my eye on these for the hubby for a while, I think they're really cool and love how they work. 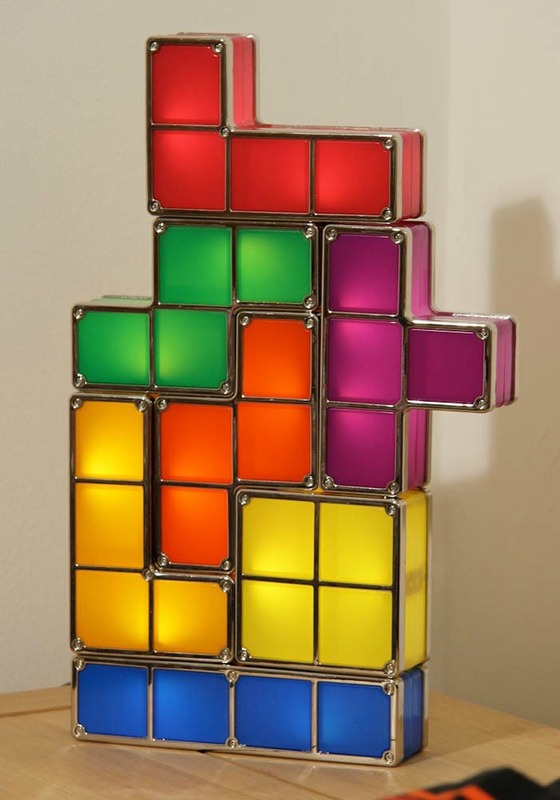 You can configure the Tetris lights in any arrangement where they fit together, just like Tetris. My only reservation now is having a toddler in the house, he'd see it as a toy, and of course, if he can't play with it, there might be tantrums. These cost £23.96 on Amazon. It's also worth mentioning escape rooms. They're taking the country by storm. In Wales alone, we have something like 17 of them now, and each one keeps re-inventing their puzzles and themes. Depending on whether you get a special deal or pay full price, you're looking at around £10-25 a head, and generally, a different challenge every time. 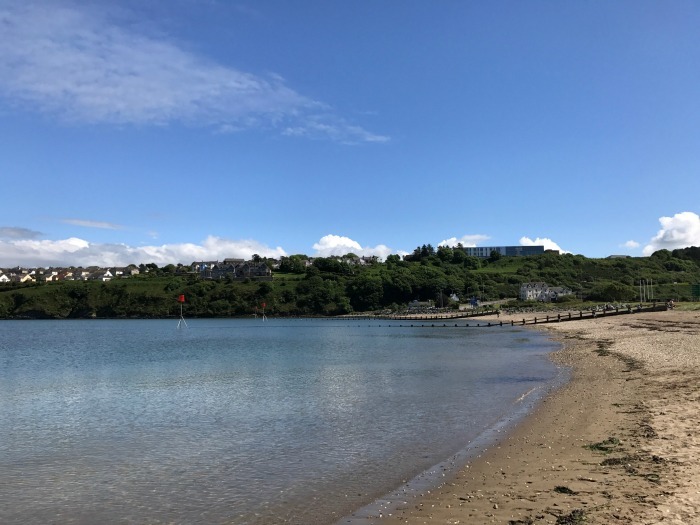 I almost can’t bring myself to call this a babymoon, as it was really going back home to Fishguard to visit family, but instead of staying in the family home, we stayed in a friend’s mobile home on a caravan park (Dinas Country Club). However, given our funds, it’s the best we could do, and boy did we make the most of it. We packed up the car on Thursday morning and headed off for Pembrokeshire (where I used to live). The weather was forecast to be awful the whole time we were there, constant rain, boo. But when we got there, it wasn’t too bad. We stopped at the shops for some essential supplies (bread, butter, chocolate obvs). We had dinner from the chippy, a rather fancy one, which was lovely, and headed home. As the van was new to Squidge, and everything was exciting, he took about 2 hrs to get to sleep and a lot of encouragement. It was his first time sleeping in a double bed! Once he was asleep, we plugged in the Nintendo Switch and played Mario Kart until we went to bed. That night, we did not sleep well. Not only was it a new bed, but it rained all night, which kept us awake. Then Squidge woke at 6:30. Friday it rained up until about midday. 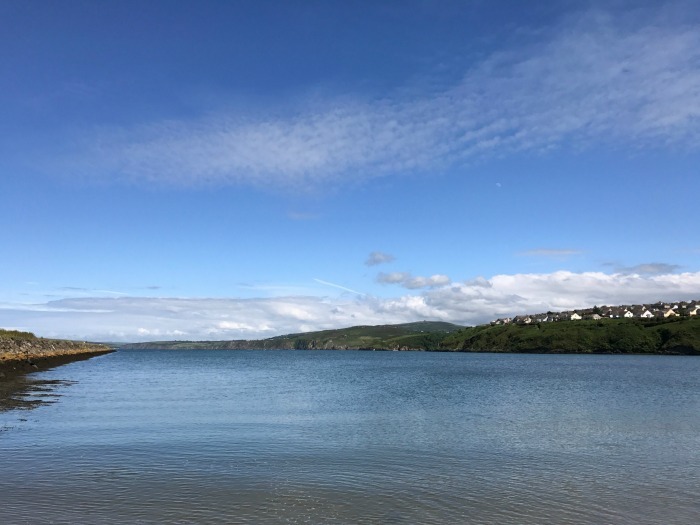 We went and picked up Grandad Roddy, and went down to Goodwick to our fav lunch spot (The Farmhouse Kitchen) - Daddy had a burger which was great, I had a toastie which was lovely, and Grandad had a baguette - be bought Squidge a picnic plate and had milkshakes. Squidge was brilliant, he stayed sat in his chair (not a high chair) the whole time. 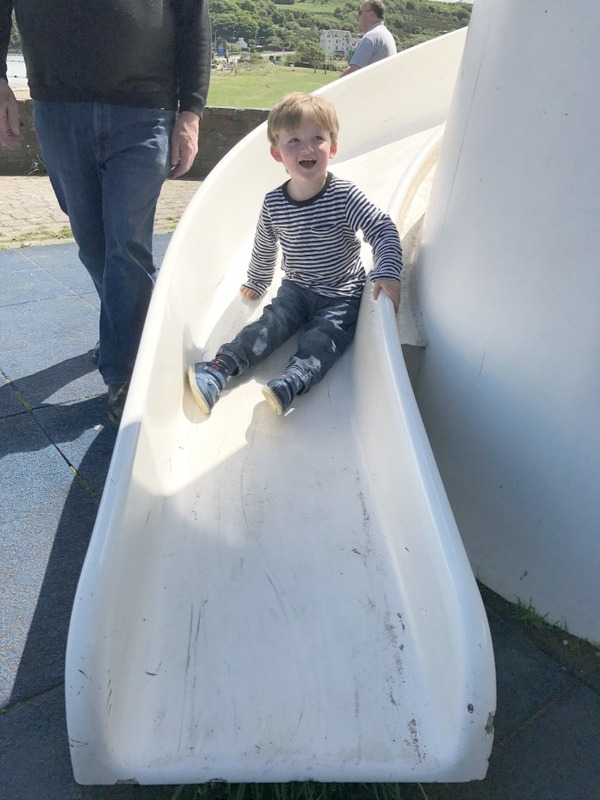 Once lunch was done, we went down to the sea front and took him to Ocean Lab to the £1 soft play there, it’s only tiny, but it was only him there, so he had a blast. By this time the weather was amazing – over 16 degrees and very very warm in the sun (you could feel yourself burn!). First time on a helter-skelter - he was so brave after being so frightened at the top! 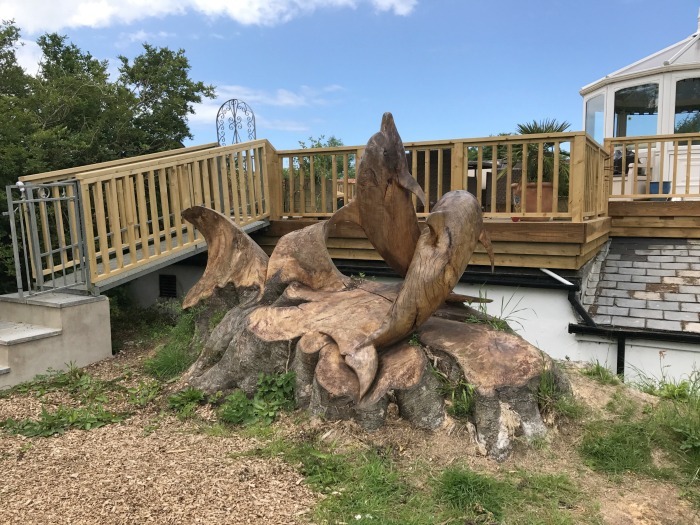 While on his first helter skelter outside Ocean Lab he spotted ‘Sand pit!’, he means ‘the beach’ which was about 10ft away from where we were standing. 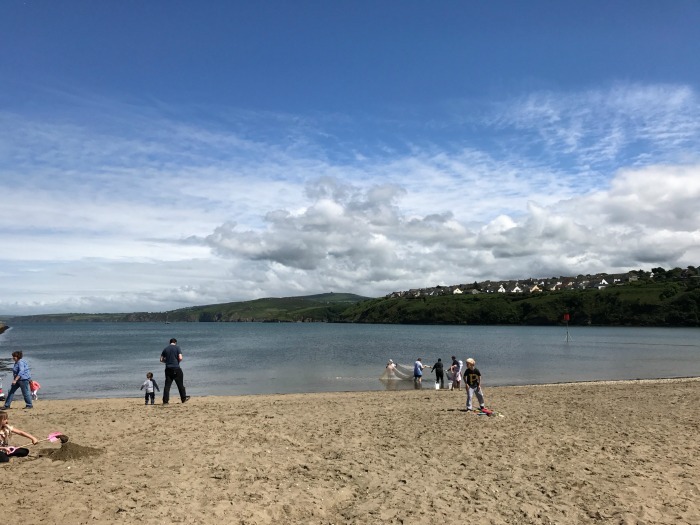 The most and only annoying thing about this – as it was raining when we left, we didn’t bring swimming stuff with us, or the bucket and spade, or the sun block etc. It was all in the van. Either way, we made the most of it. I bought another bucket and spade from Ocean Lab and a new bottle of factor 50 sun block. For the first hour or so Squidge and Daddy were skimming stones by the sea, then when they came back up, I had the bucket and spade and Squidge took it down to the sea’s edge. He made lots of friends and played with a few children, running in and out of the sea as the tide would come in and out with the waves, he thought it was really funny. We had to take his trousers and shoes off for that bit, leaving him in a nappy and a long sleeved top! No pics I’m afraid, there was a naked 3 year old Squidge made friends with, so I didn’t take any pics. After being tuckered out from the beach, and no nap, we went back to Grandad Roddy’s and got a take away. Once we’d had that we headed back to the van and Squidge crashed, he was shattered! Saturday the weather was still nice and we decided to have a day of no driving and stayed at the van, we invited Grandad Roddy to come and chill with us. 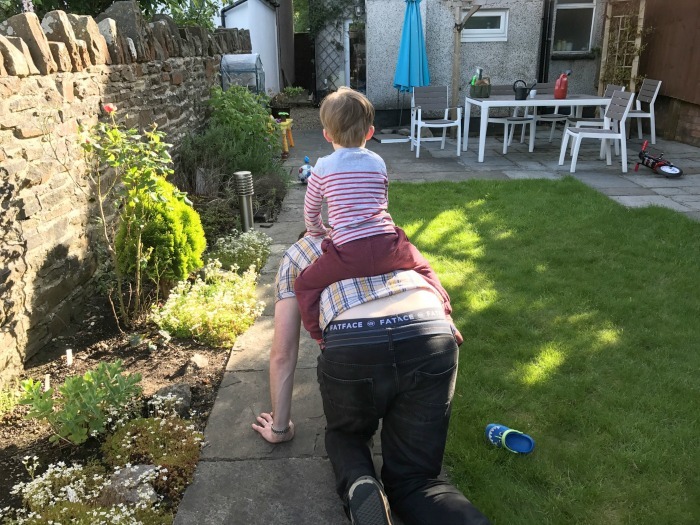 Squidge realised we’d brought his balance bike, so Daddy spent a lot of the day running around the caravan park keeping up with super-fast Squidge :) In the evening we headed to the clubhouse and had dinner, with an exhausted Squidge. It was a bit tricky, but we got through dinner and got the little man back and asleep, albeit about an hour later than we’d have liked. Once he was asleep, we played Mario Kart until about 11pm when we were ready for bed. Just as we were turning the console off, I’d seen that a news flash had come through on my phone about a van driving into people in London, so we put BBC News 24 on to see what was going on, and to our horror a terror attack seemed to be unfolding. We stayed up until about 1:30-2am watching the news and seeing eye-witness people calling in with horrendous accounts of what had happened. We went to bed feeling sick to our stomachs, and I was on the verge of waking up Squidge to give him the biggest cuddle, but sense prevailed. Squidge slept until 8am, such a poppet. Sunday morning was spent packing up and cleaning the van, then at 12:30 we went back to the clubhouse for Sunday lunch, it was great! Good food and well priced. Squidge got the vanilla ice cream he’d been asking for so was one happy boy, despite waking up tired and grumpy (just like mummy). We headed straight home from there, and got home about 5:30 after a long break half way. It was a lovely couple of days, and as we stayed somewhere different, it felt more like a little holiday than heading down that way has ever felt before. Just what we needed. The only downfall of the break was the horrendous wifi… if you managed to connect, it was too slow to actually update anything. Very frustrating after the London attack when I was trying to find out if friends and family in the area were ok, but in the grand scheme of things, pretty insignificant.